Walt Disney is to produce anime films in Japan in tie-ups with local studios to adapt to regional tastes, the company has announced. The first will be a short children's film about a robot, made jointly with Japan's biggest animation studio Toei Animation Company. The company also plans to make a Japanese version of Lilo and Stitch. All the movies will be made using local animation creators and computer graphics specialists. 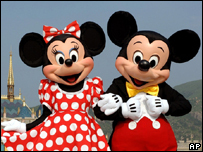 Disney spokesperson Mariko Hisamitsu said: "We aim to provide products that match the taste of the local market. "Disney characters are well recognised in Japan and we believe providing contents catering to consumers is necessary to expand the market." The entertainment company's strategy has traditionally been to distribute the same US-made films around the world.